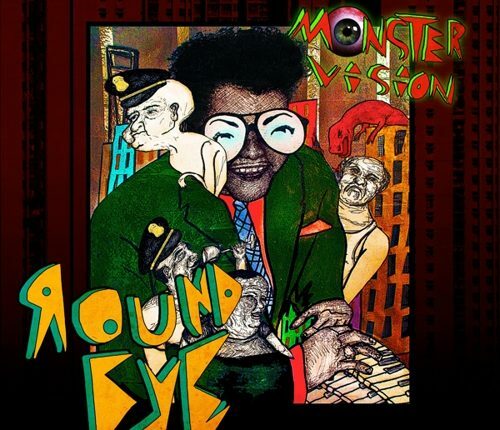 Even on first examination of Monster Vision, it’s perfectly clear how poised to totally reinvigorate punk rock Round Eye really are now. The band’s 2015-issued debut album hit those who heard it like a force of nature and won converts to the band’s banner effortlessly, but their sophomore effort is something else; Monster Vision manages to retain the fury and mania of its predecessor, but also illustrates that the group isn’t just a band of lucky savants. Rather, on Monster Vision, they’re organized, focused and make it plain early that they’re making the sound they are at least in part with the desire to establish what they’re doing as a unique socio-artistic statement not just as a clever novelty. Furthering that point, the band has elected to jump in at the front of the potential pack of politically-infuriated punks and angle the album as criticism of President Donald Trump. Before a note of music escapes the album, listeners can feast their eyes on a rather porky caricature of Trump on the CD itself and then chuckle warmly as film critic Joe Bob Briggs lines up what listeners can expect to come song-by-song on the album as he both opens and introduces the proceedings (check out “I’m Joe Bob Briggs and this is the Chinese take-out edition of Monster Vision so check your chopsticks ready and join me as we dine on some sweet and sour Trump, General Tso’s Clinton, a cup of steamin’ hot red white and blue tea and an inevitable and ever-ominous fortune of doom from a cookie that tastes like it’s been sitting in some all-day convenience store in Shanghai for the last thousand years. This is the year of the monkey goin’ into the year of the rooster, but let’s not dwell on that – I think we’d better bang a gong and light this candle” – doesn’t that about say it all?). That image proves to hold up vividly as Monster Vision progresses. “Billy,” the second track and first single released from the album sees Stooges saxophonist Steve Mackay return to the group’s ranks again and contribute what would be his final performance ever committed to tape (he passed away on October 10, 2015) before segueing into “Sifter,” and then “”Troma” so smoothly that it will leave listeners in complete disbelief. In the cases of each of those tracks, full lyric sheets and dramatic, compelling vocal performances by lead singer Chachy make for hypnotizing fare, but it’s only after a couple of listens that fans realize that the compositional chops have improved so remarkably too. The way that the songs bend and flow together but always keep clearly defined individual structures is just flat-out incredible. Monster Vision will be released on CD via Sudden Death Records on May 5, 2017, and released on vinyl on May 19, 2017. Both can be pre-ordered here and here on Amazon, or purchased directly from Sudden Death Records here.